We all know who Dave Ramsey is. What you may not know is that Dave has recently entered into the college finance arena with his new product, the Custom College Guide. The product provides a comparison breakdown of the top 6 schools you are interested in attending and gives you a cost summary based on your personal financial situation. 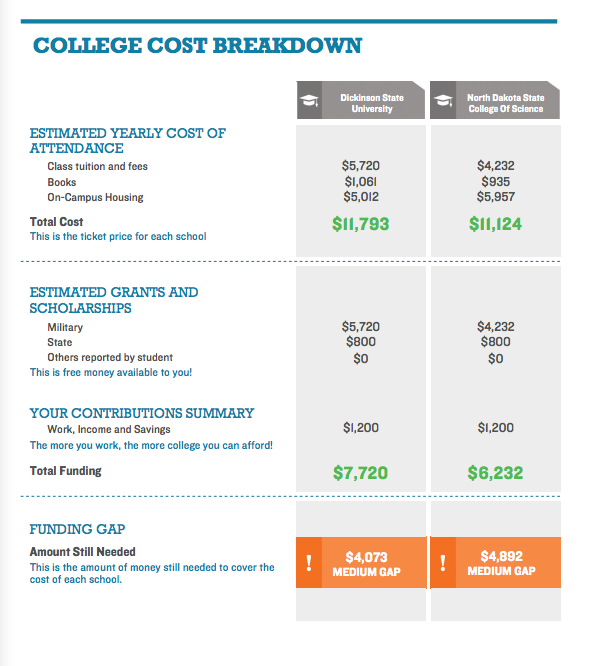 It claims to take the work out of the college cost comparison process for you by automatically compiling the information for you. The product also provides free FAFSA preparation, filing and support for you. I respect Dave Ramsey’s stance on finances a great deal. His philosophy on credit, living debt free, and his steady investing strategy all resonate well with me. Moving into the college finance arena however, was a risky move. Dave Ramsey’s service actually uses the services of Student Aid Services. They essentially pull all of the estimated cost of attendance information from the net price calculator required at every college. Every figure listed under the “Estimated yearly cost of attendance” is pulled directly from these figures on a college’s website. The next category down includes all of the grants and scholarships that you may be eligible for. If you will notice in this example, a large portion of the scholarships are provided through military assistance. This is obviously NOT money that is available to the majority of students. SOme students may be VA recipients, some students may be active military or college ROTC, but this is not a scholarship that a majority of U.S. students would qualify for. Including this military assistance in the scholarship package can be very misleading. I do really like the section included in the “Your Contributions Summary”. I think it is important for students to work during college, so I am very glad Dave’s folks made the decision to put this in there. Also, student loans are not listed here which is encouraging! Then the bottom of the cost comparison you see how large your gap is, between your costs and the funding you have secured. This information can then be used to make the decision on where you would like to go to college. First, I don’t like the fact that the military assistance plays so prominently in the online example. The military is not an option for everyone, so this can be very misleading. Second, there are no federal financial aid benefits from FAFSA listed here. Federal Pell grants, FSEOG, and other grants could add some additional aid for students. Third, do you really want to pay $139.99 to have someone do this service for you? I have had this debate with my colleagues and here on the blog before, but would you feel comfortable paying for this service that you can easily do yourself? I would argue that for most people, this is not a good bargain. All of this information is free and available to you, with a little time and effort. However, for many people this could be an invaluable decision making tool, and one which frees you up to work on other projects. The Custom College Guide proclaims to be personalized to each student, but it can only go so far. It will never know what your exact college costs will be, it can never tell you the exact amount of financial aid you will receive, it cannot make the decision for you. As with most things in life, it is important to remember that making a decision as important as where to go to college should only be made after weighing all of your options and seeking wise counsel. This product could be a good guide for you, but I would encourage you to do your own research to see how Dave’s answers compare with your own! I would never buy this product, but I also work in college finances and am much familiar with this product than the average parent or high school student. It could be a good option for you, but just remember that this is not proprietary information. It is an information gathering service in a slick package. If that is what you want, awesome! But don’t be fooled into thinking that Dave is working magic here. Based on your screenshot above, it doesn’t really seem like it’s giving you much information. The only really helpful numbers seems to be estimates for books and housing, but those numbers are typically pretty easy to get on your own. Maybe if they had something that help you target specific scholarships, that might actually be helpful, but otherwise it kind of seems like a waste of money to be honest. I agree with you Matt. They do have a separate scholarship module, but it only looks at Federal grants, through the FAFSA. Unfortunately, the problem is that private scholarships are just so difficult to actually find. I don’t like the idea of them automatically adding in the military assistance, as most students won’t be eligible for that (this should be one of the questions they ask during the interview). Just by reading what you have to say about this product and seeing the final report, I agree with you completely. They take a few lines of publicly-available information and stick them in a report. Most of that information can be found on the college’s website (at least it is on my employer’s and also ones I’ve looked into for a Ph.D. program). I can’t imagine how it would be worth $140 to have someone do this small amount of work for you. The only way it may be worth it is if they connected the student with a number of potential scholarships that fit their background/experience. Unfortunately Khaleef, I could not find anywhere where they connected students with actual scholarships. The $140 really does go towards the slick marketing and the nice layouts. I could do the same thing on a lined notebook paper, but it would not look as fancy. It is definitely an issue of paying for convenience.